The two countries are crucial US allies in Asia, and both face serious threats in their near abroad. Discussing security threats, however, wasn’t the primary purpose of Mattis’s visit. The purpose was to reassure both countries that the administration of President Donald Trump will not abandon the US alliance structure in the Pacific. 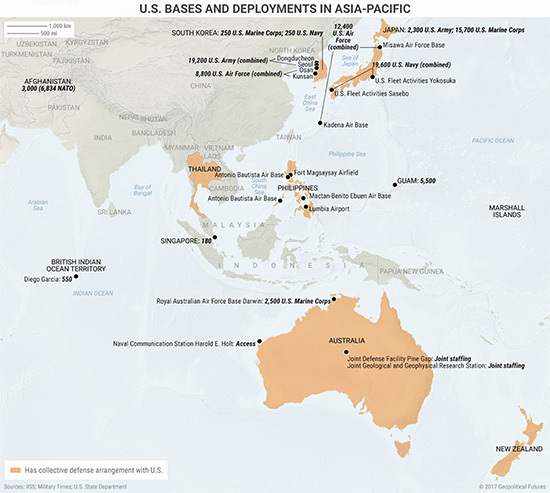 In light of Mattis’s visit, we thought it might be useful to examine current US military and investment positions in the Asia-Pacific región. The United States used containment as its primary strategy in blocking the Soviet Union. Looking at the map above, we can see that the US is following a similar strategy with China. US military assets stationed in Asia-Pacific countries have two purposes. First, they ensure US naval power projection in the Pacific Ocean. Second, and by extension, they help contain Chinese ambitions. Besides Guam (which is US territory), the US has no sovereign soil in the Western Pacific Ocean. The US must therefore have good relationships with strategically located countries in the Pacific where it can base ships and soldiers. Japan, South Korea, and Australia are the most important US allies in the region, but the US also maintains varying degrees of cooperation with countries like the Philippines, Thailand, and Singapore. The Philippines is a key part of this strategy. But it is also being courted by China. Geopolitical Futures is bearish on China’s long-term (even medium-term) future. Currently, however, China is the second-largest economy in the world. It is pouring money into its military development and trying to attract cooperation from other countries. The Philippines is the prettiest girl at the dance right now—Manila has Washington, Beijing, Tokyo, and others chasing it around with promises of investment and protection in return for security guarantees. The Mutual Defense Treaty between the US and Philippines remains in place, but the two sides only recently agreed on which Philippine bases the US can use. The US still hasn’t been given permission to return to the much-coveted naval base at Subic Bay. The Philippine president is also full of anti-US rhetoric these days. The US wants naval control of the oceans. It has a strong navy, but a navy by itself isn’t enough. Containing China is another major part of its Pacific strategy. Even if China could be contained by means other than US power, the US would still want Pacific partners to help project its naval power. Beneath all the noise is the simple fact that the US maintains an impressive military presence in the Pacific. Mattis will remind US allies how important they are to US interests and that US intentions can be measured in commitments, not headlines. In addition to its military strategy, the US is employing an economic strategy. It wants countries to see the economic benefits of cooperating with the US. The United States is the largest economy in the world. It has used this economic power very effectively in the past. 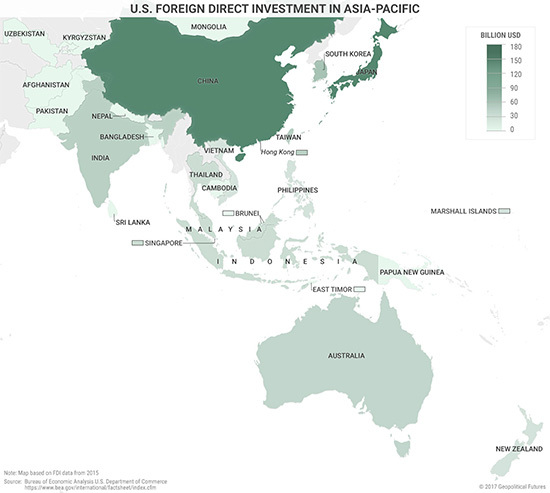 The first thing to note from the map above is that the largest destination for US foreign direct investment (FDI) in the Asia-Pacific region is not an American ally… but China. China’s economy is in the midst of a huge transition. The US-Chinese economic relationship is important to both sides, but particularly for China. The US is China’s largest export market. This happened in part because US companies could profit by moving production to China. Now, Beijing needs to move up the value chain by attracting foreign investment and technology (of which the US is a major source). If China seriously challenges the US, it risks these economic benefits. The next five largest beneficiaries of US FDI in the region are crucial American allies and partners. Japan, South Korea, and Australia are at the top of the list. Singapore, located on the strategically important Strait of Malacca, is next. The military containment strategy displayed by the first map focuses mainly on blocking Chinese access to the Pacific. In contrast, this map of US FDI distribution shows a strategy not of containment but of widespread US economic influence across Asia-Pacific. It should also be noted that some US FDI is directed to small countries, such as the Marshall Islands. The amount of FDI is lower because these are smaller economies, but the investments are arguably more important for the economic development of those countries. Being a US ally, or even a US partner, means access to US investment. The price of being a US ally can be high, but it also comes with key benefits. These two maps are snapshots of US power. They are also snapshots of US needs. 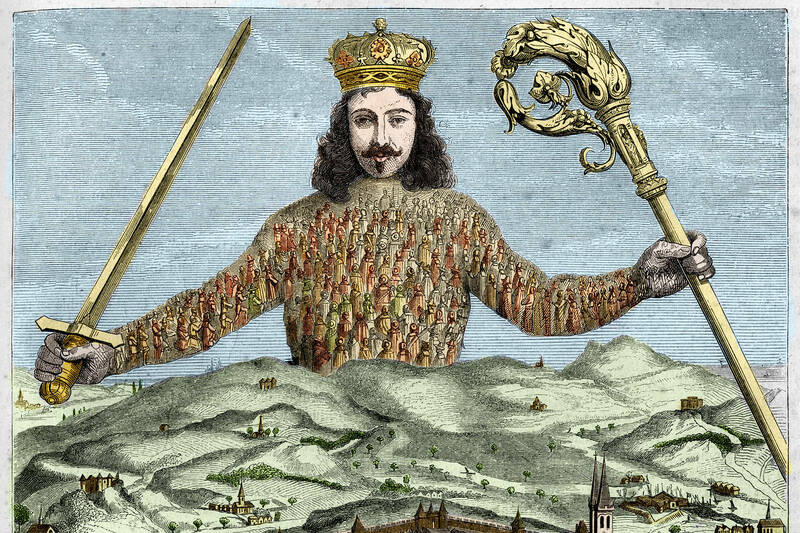 The US imperative is to maintain its dominance of the world’s oceans. Ships need ports. Planes need bases. For these basic necessities, the US must have good relationships with strategically located countries in the Pacific. These countries, in turn, rely on the US for protection and for preservation of the status quo. The Trump administration wants more from its allies… not less. Mattis’s job will be to communicate the reliability of US security guarantees, and also to remind these countries that the relationships exist because of shared interests. The US asking more of these countries does not mean US presence will decrease. It means admitting US presence will not solve all their problems. LONDON – Disconcerting political developments in the United States and the United Kingdom might lead one to conclude that an already challenged world economy will struggle even more in the near term. But as we continue into 2017, the cyclical evidence actually suggests otherwise. Since my days as Chief Economist at Goldman Sachs, I have kept an eye on six indicators from around the world that, taken together, provide a reliable snapshot of what the global economy will look like for the next six months. Right now, all six indicators show more promise than they have for some time, and only one of them has fallen slightly from a recent high. The first indicator is weekly unemployment claims in the US, from which one can gauge the overall strength of the US economy. Economists are rightly trained to treat unemployment as a lagging indicator, but these data can also be useful in forecasting the near future. US jobless claims are always up to date, because they are produced weekly, and statistical evidence suggests that they are a leading indicator for US equity prices. As of last week, jobless claims remained rather low, as they have for some time, which bodes well for US stock markets. Similarly, the Institute for Supply Management Manufacturing Index provides a pretty good preview of the US economy for the next 3-6 months, even though manufacturing comprises a relatively small share of GDP. Like the latest jobless claims, the ISM’s numbers are currently giving cause for optimism. A third indicator is a subcomponent of the same ISM survey: manufacturers’ new orders and inventories. Currently, new orders are increasing and inventories are low, which suggests that businesses will have to produce more in the coming months to satisfy those orders. Looking beyond the US, a fourth indicator is the ratio of Chinese retail spending relative to industrial production (adjusted for inflation). These figures give us a glimpse of both cyclical trends and China’s structural rebalancing away from exports and toward domestic consumption. This will arguably be one of the most important indicators for both China and the rest of the global economy for years to come. The ratio of Chinese monthly retail sales to industrial production, while erratic, has been slowly trending higher since 2008, and there appears to have been another uptick in consumption recently. This is why I am less worried than others about frequently cited risks confronting the Chinese economy. Chinese consumer spending has remained strong despite the slowdown in industrial output and investment and the government’s efforts to constrain spending on luxury goods. Some might object that Chinese data cannot be trusted. But I do not see why the data on one side of the ratio would be any more or less reliable than data on the other side. Why would Chinese officials fiddle with consumption data while allowing the industrial-output figures to register a decline. In any case, we have to work with what we have. A fifth indicator is South Korean trade data, which is consistently reported on the first day of each month after trades occur – faster than any other country. South Korea has an open economy and trading partners around the world, including the US, China, Japan, and the European Union, so one can extrapolate from its trade data to draw conclusions about the state of global trade. After trending down in recent years, South Korean trade since November has shown signs of recovering, notably in terms of export growth; and in January, it bounced back significantly. To be sure, this finding is at odds with all of the eulogies for globalization that one hears these days, and Donald Trump’s decidedly protectionist administration in the US could now send global trade into a long retreat. But South Korea’s recent data suggest that globalization still has some life left in it, and that 2017 is off to a decent start. In fact, barring the worst-case scenario under Trump, it is possible that the slowdown in global trade in recent years will turn out to be a temporary phenomenon. It may have been a singular occurrence that reflected a variety of factors, including the euro crisis; continued economic weakness in many European countries; the sharp decline in commodity prices; dramatic slowdowns in Brazil, Russia, and other emerging economies; and tighter regulations for international banks, which might have hindered trade finance. The last key indicator is the monthly Ifo Business Climate Index in Germany, which contains useful cyclical data for Europe overall, owing to Germany’s centrality in the continent’s economy. The Ifo survey has reported positive results in recent months, although the data were more promising in December than in January. Taken together, these six indicators suggest to me that the global economy might now be growing at a rate of more than 4%. This is the fastest growth in a number of years – although the last decade’s average growth rate of 3.3% was barely lower than the rate in the previous decade – and close to the pace of the previous two decades before that. At the same time, the six indicators cannot tell us anything about what will happen after the next few months. It is an open question whether global economic growth will remain strong, strengthen further, or start to weaken. It has been interesting to watch growth accelerate in the face of shocks such as the UK’s Brexit referendum and Trump’s election. And yet it is unclear why this is happening. Some might say the trend is a result of policy decisions in the US and UK, but far more would probably say that it is happening despite those decisions. Unfortunately, there are no indicators that provide an answer to this question – only time will tell. Conservatives were outraged by Obama’s apologies. What about Trump’s slander? First, the obvious: Had it been Barack Obama, rather than Donald Trump, who suggested a moral equivalency between the United States and Vladimir Putin’s Russia, Republican politicians would not now be rushing through their objections to the comparison in TV interviews while hoping to pivot to tax reform. Had it been the president of three weeks ago who had answered Bill O’Reilly’s comment that Mr. Putin “is a killer” by saying, “We’ve got a lot of killers,” and “What do you think? Our country’s so innocent?” conservative pundits wouldn’t rest with calling the remark “inexplicable” or “troubling.” They would call it moral treason and spend the next four years playing the same clip on repeat, right through the next election. In 2009, Mr. Obama gave a series of speeches containing passing expressions of regret for vaguely specified blemishes from the American past. Examples: “The United States is still working through some of our own darker periods in history.” And “we’ve made some mistakes.” This was the so-called Apology Tour, in which the word “apologize” was never uttered. Even so, conservatives still fume about it. This time, Mr. Trump didn’t apologize for America. He indicted it. He did so in language unprecedented for any sitting or former president. He did it in a manner guaranteed, and perhaps calculated, to vindicate every hard-left slander of “Amerika.” If you are the sort who believes the CIA assassinated JFK, masterminded the crack-cocaine epidemic, and deliberately lied us into the war in Iraq—conspiracy theories on a moral par with the way the Putin regime behaves in actual fact—then this president is for you. For the most part, the left’s various indictments of the U.S., whether well- or ill-grounded, have had a moral purpose: to shame Americans into better behavior. We are reminded of the evils of slavery and Jim Crow in order not to be racist. We dilate on the failure in Vietnam to guard against the arrogance of power. We recall the abuses of McCarthyism in order to underscore the importance of civil liberties. Mr. Trump’s purpose, by contrast, isn’t to prevent a recurrence of bad behavior. It’s to permit it. In this reading, Mr. Putin’s behavior isn’t so different from ours. It’s largely the same, except more honest and effective. The U.S. could surely defeat ISIS—if only it weren’t hampered by the kind of scruples that keep us from carpet bombing Mosul in the way the Russians obliterated Aleppo. The U.S. could have come out ahead in Iraq—if only we’d behaved like unapologetic conquerors, not do-gooder liberators, and taken their oil. This also explains why Mr. Trump doesn’t believe in American exceptionalism, calling the idea “insulting [to] the world” and seeing it as an undue burden on our rights and opportunities as a nation. Magnanimity, fair dealing, example setting, win-win solutions, a city set upon a hill: All this, in the president’s mind, is a sucker’s game, obscuring the dog-eat-dog realities of life. Among other distinctions, Mr. Trump may be our first Hobbesian president. It would be a mistake to underestimate the political potency of this outlook, with its left-right mix of relativism and jingoism. If we’re no better than anyone else, why not act like everyone else? If phrases such as “the free world” or the “liberal international order” are ideological ploys by which the Davos elite swindle the proletarians of Detroit, why sacrifice blood and treasure on their behalf? Nationalism is usually a form of moral earnestness. Mr. Trump’s genius has been to transform it into an expression of cynicism. That cynicism won’t be easy to defeat. Right now, a courageous Russian opposition activist named Vladimir Kara-Murza is fighting for his life in a Moscow hospital, having been poisoned for a second time by you-can-easily-guess-who. Assuming Mr. Trump is even aware of the case, would he be wrong in betting that most Americans are as indifferent to his fate as he is? The larger question for conservatives is how Mr. Trump’s dim view of the world will serve them over time. Honorable Republicans such as Nebraska’s Sen. Ben Sasse have been unequivocal in their outrage, which will surely cost them politically. Others have hit the mute button, on the theory that it’s foolish to be baited by the president’s every crass utterance. The risk is that silence quickly becomes a form of acquiescence. Besides, since when did conservatives reared to their convictions by the rhetoric of Winston Churchill and Ronald Reagan hold words so cheap? Speaking of Reagan, Feb. 6 would have been his 106th birthday. Perhaps because he had been an actor, the 40th president knew that Americans preferred stories in which good guys triumphed over bad ones, not the ones in which they were pretty much all alike. Conservatives should beware the president’s invitation to a political film noir in which the outcome is invariably bleak.